Just as the BQA has its Order of Merit and UK rankings, the International Quizzing Assoc. also maintains rankings. These are calculated in a more simple fashion, which I shall explain before appending a graphic showing the current standings after the 2013 EQC. The top 100 finishers in the WQC receive ranking points (per schedule below) with the winner getting 100 points. 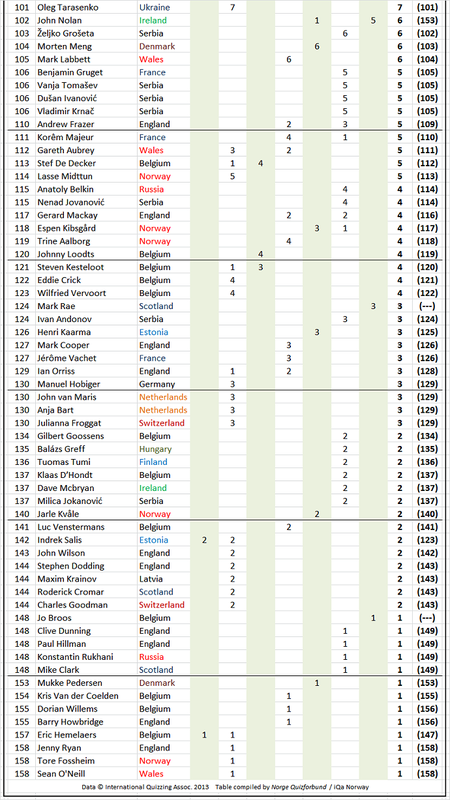 The Top 50 in the EQC Individual competition likewise receive points (see schedule), with the winner getting 70 points. A 1st place WQC finish earns 100 iQa ranking points. 25th & 26th place 15. 27th & 28th place 14. 29th & 30th place 13. 31st & 32nd place 12. 33rd & 34th place 11. 35th - 38th place 10. 39th - 42nd place 9. 43rd - 46th place 8. 47th - 52nd place 7. 53rd - 60th place 6. 61st - 68th place 5. 69th - 76th place 4. 77th - 84th place 3. 85th - 92nd place 2. 93rd - 100th place 1. A 1st place EQC individual quiz finish earns 70 iQa rankings points. 2nd place earns 60 points. 21st & 22nd place 10. 23rd & 24th place 9. 25th & 26th place 8. 27th - 29th place 7. 30th - 32nd place 6. 33rd - 35th place 5. 36th - 38th place 4. 39th - 42nd place 3. 43rd - 46th place 2. 47th - 50th place 1. 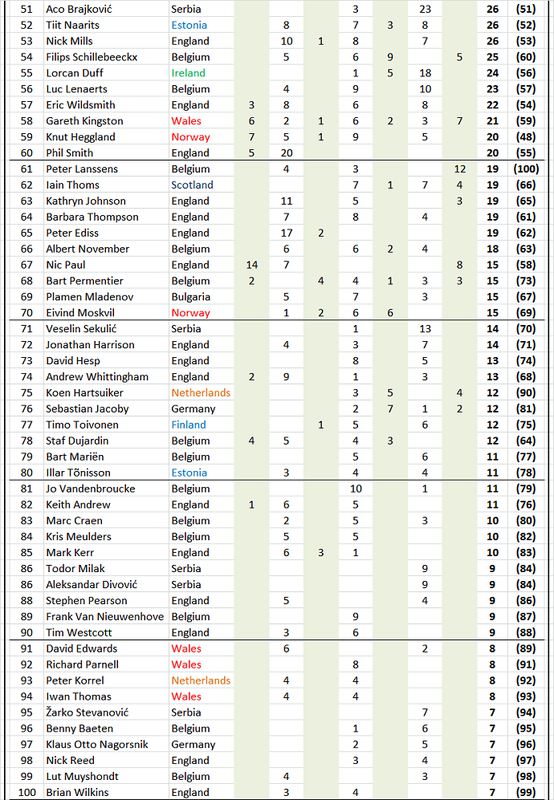 The rankings table below is based on an aggregate of WQC and EQC results and take into account the last three runnings of each event, at full ranking points value (there is no 'erosion' of points happening over the length of the period for which results are taken into account). 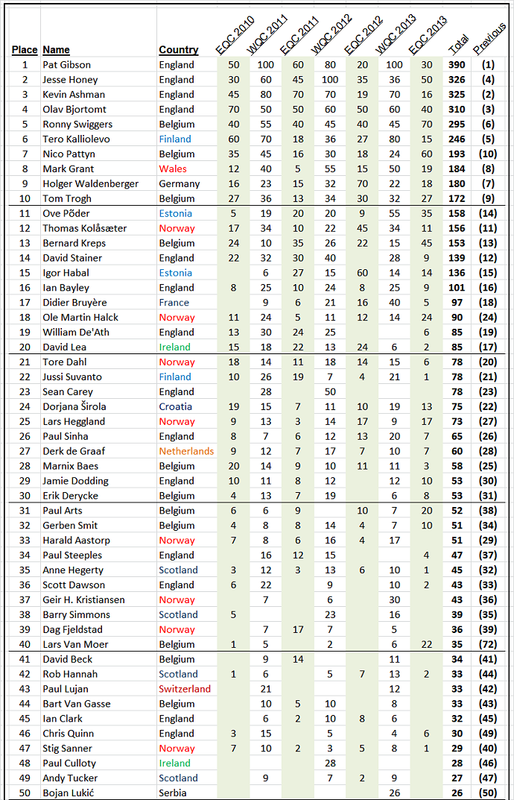 We congratulate Pat Gibson who has overtaken Kevin Ashman to become iQa Europe's top ranked Quizzer.